OCI Solar Power and partners Mission Solar Energy, Sun Action Trackers, KACO new energy and Mortenson Construction, have created nearly 600 jobs in and around San Antonio and generated $134 million in capital expenditures since 2012. These endeavors exceed milestone agreements set with CPS Energy and allow the OCI consortium to continue building renewable power generation for CPS Energy, including Alamo 6, a 110-megawatt (MW) solar farm currently being developed and set to be online in late 2016. 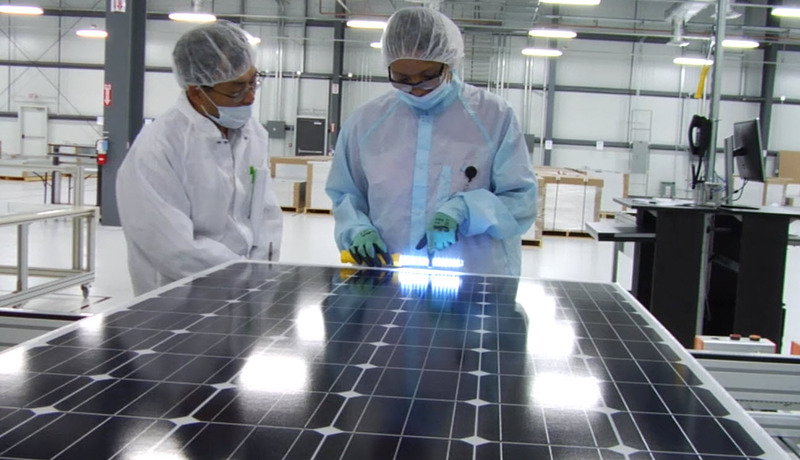 Mission Solar employees inspect each solar module at the manufacturing facility at Brooks City Base. In 2012, CPS Energy signed a first-of-its-kind purchase power and economic development agreement with OCI Solar Power to build 400 MW of solar power while creating 800 jobs and an economic impact of $700 million. Since then, four farms and 90 MW of new sun power have been created and put into commercial operation. A fifth farm will be online later this year. Many of the farms use high-efficiency solar modules produced by Mission Solar Energy, advanced tracking devices developed by Sun Action Trackers, and solar photovoltaic inverters produced by KACO. Mortenson Construction has built each farm and will build the remaining three farms. Jobs created by consortium partners range from factory positions like assembly technicians, electricians and engineers to administrative specialists in accounting, logistics, human resources, business development and other areas. OCI Solar Power companies have utilized or built a number of facilities around San Antonio, and acquired the equipment, furniture and other items needed to execute business operations. Last September, OCI Solar Power opened the Mission Solar Energy manufacturing facility at Brooks City Base on the city’s South Side. The 240,000 square foot facility is the first commercial manufacturer of N-type solar cells and modules in the United States. Sun Action Trackers operates a 38,000-square foot facility on the north side. KACO recently expanded its manufacturing space off Binz-Engleman Road from 56,000 square feet to more than 86,000 square feet. CPS Energy’s New Energy Economy is built on partnerships with companies who share our belief in clean energy, innovation and energy efficiency. CPS Energy worked with a number of partners to turn these principles into economic development while protecting the environment and helping customers use energy more wisely. Through the NEE, CPS Energy is focusing and investing in clean energy and innovative technologies like solar power, LED lighting, energy storage and grid of the future. OCI Solar Power is a leader in the solar power industry, providing innovation and development for solar power plants in communities in the United States and globally. OCI Solar Power works with local officials, community organizations and local partners to engineer, develop, construct and operate solar projects. OCI Solar Power has more than 400 MW of solar photovoltaic projects currently in operation and under development. San Antonio, Texas-based OCI Solar Power is owned by Atlanta-based OCI Enterprises. For more information, visit www.ocisolarpower.com.